College students seriously underestimate the effects of drinking a new class of beverages being marketed across the country, according to a new George Mason University study. A new report from the Center on Alcohol Marketing and Youth (CAMY) at the Johns Hopkins Bloomberg School of Public Health calls into question whether existing federal and voluntary standards for alcohol advertisements curtail potentially damaging content and protect public health. The content of alcohol ads placed in magazines is more likely to be in violation of industry guidelines if the ad appears in a magazine with sizable youth readership, according to a new study from the Center on Alcohol Marketing and Youth (CAMY) at the Johns Hopkins Bloomberg School of Public Health. Published in the Journal of Adolescent Health, the study is the first to measure the relationship of problematic content to youth exposure, and the first to examine risky behaviors depicted in alcohol advertising in the past decade. The liquor industry’s decision to voluntarily include health warning labels on alcohol is a welcome move, but alone is unlikely to make a significant impact on the health and social consequences of alcohol abuse and binge drinking in Australia. According to the latest national drug survey, ‘2008 Australian Secondary Students Alcohol and Drug Survey’, more school students use the drug ecstasy, but fewer of them smoke. The report came out this Tuesday. Protestors in Britain have called for a ‘watershed’ for alcohol advertising on TV amid claims that millions of children watched the ads during live World Cup games. Alcohol Concern UK says that children as young as four watched alcohol ads from brands such as Stella Artois, Magners, Fosters, Carling and WKD during the World Cup. To advocate for the passage of AB 1598 – Authored by Assembly Member Jim Beall (D-San Jose), the measure will prohibit the import, production, manufacture, distribution, or sale of caffeinated malt beverages (Alcoholic Energy Drinks – AEDs) in California. A new study from the Center on Alcohol Marketing and Youth, in collaboration with UCLA, has found a striking correlation between teenage viewership and the frequency of alcohol advertising on cable television. The findings show that ads for beer, spirits and "alcopop" aired much more frequently when more teens were watching. Contrary to the industry's position that visible drink labels will promote responsible drinking, young people are, instead, using these visible standard drink labels to increase or even maximize the amount of alcohol they consume at the lowest cost possible. Australia's top medical experts have called for the retention of the 'alcopops' tax and have wholeheartedly thrown their support behind the Federal Government's plans to reintroduce the tax. The medical profession in Britain has called for action on the sale of cheap alcohol because they believe it is fuelling an epidemic of binge drinking. Opening a tall cool beverage during the ball game or at a backyard cookout on a hot day is what families do. According to a new report from the University of Wollongong in New South Wales, 90% of 12 to 17-year-olds in the state have used alcohol; the report also reveals that the level of risky drinking by adults has decreased from 50% to 30% in men and 37 to 27% in women. The advertising of alcohol, the marketing of alcoholic products, peer pressure and parental influence all play a part in the level of alcohol consumption among young people. The Australian Medical Association (AMA) is calling for taxes on junk food and sugary drinks and subsidised fruit and vegetables to beat the obesity epidemic. According to the insurance company Standard Life, Brits are drinking themselves to obesity. 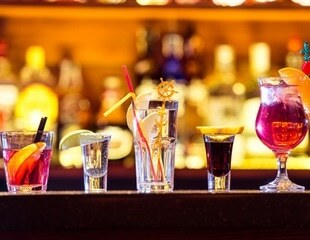 The American Medical Association (AMA) released the results of two nationwide polls today that reveal the extent of underage consumption and marketing exposure to "alcopops" or so-called "girlie drinks." The AMA expressed concern that hard-liquor brands are using these sweet-flavored malt beverages as "gateway" beverages to attract less-experienced drinkers.